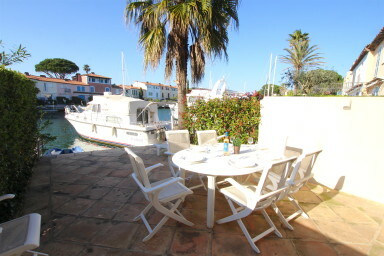 Nice extended house Ostale kind in a private area of ​​Port Grimaud. It has 2 terraces for a double orientation East / West, allowing you to enjoy the sun throughout the day until sunset. On the street side, a large patio to enjoy the sun in the morning. On the ground floor, a spacious living room with an open-plan kitchen and guest toilets. On the 1st floor, 2 bedrooms with a double bed, 1 bedroom with 2 single beds and a bathroom with toilets. On the canal side, a lovely terrace that will be sunny until sunset. A numbered parking space nearby.